Here in Lancaster County it is not easy to stay indoors. The fields, meadows, and creek banks of nearby farms seduce you away from your work and lure you from your responsibilities. Why be chained to your desk, when you could be wandering along the creek in search of crayfish? We have a long history, here, of Lancaster Countians who wandered away from their "real work" to become renowned authorities in the natural sciences: biology, botany, and other studies of nature and the outdoors. Henry Muhlenberg was a Lutheran pastor who strolled around his rectory in search of Lancaster's roadside sedges, weeds, and grasses ...and became a premier American botanist in the process. And there was Samuel Haldeman, who was interested in anything that moved outdoors (and sometimes moved indoors): insects, spiders, mollusks, crustaceans... He became one of America's leading naturalists, presumedly at the expense of his family's iron and sawmill businesses. 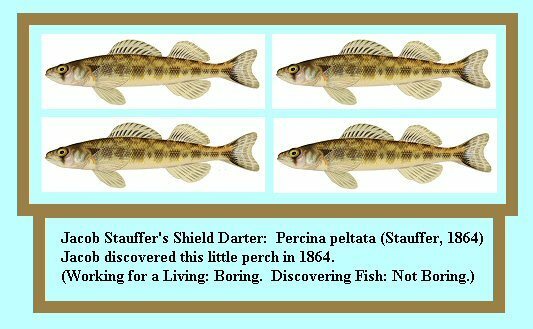 The printer / biologist Jacob Stauffer is an illustrious member of this club of mostly-self-taught scientists who were distracted from their real work by Lancaster's creeping, crawling, swimming, flying wildlife. Jacob was a sometime-printer / a sometime-pharmacist, and a full-time artist and lover of the outdoors. Jacob Stauffer, born in 1808, was always interested in art and nature, although his store-keeper father would not allow him to become a professional artist. In 1830 Jacob brought the first printing press to the town of Manheim, Lancaster County. He probably printed the first newspaper in that town. By 1840 he moved his printing business to today's town of Mount Joy. It was the first printing press for that village, also. In Mount Joy, Jacob also began printing lithographic prints, and introduced daguerreotype photography to this region. Jacob became more and more involved in his passion for natural sciences. He corresponded with the leading American botanists and scientists, including Asa Gray of Harvard, Prof. Joseph Henry, and Prof. Edward Drinker Cope. In 1865 the Philadelphia zoologist Edward Cope named a Central American tree frog for Jacob (an excellent, amphibious claim to immortality). Today this little frog is known as Hyla staufferi (Cope), or Stauffer's Treefrog. It is Here, fourth frog down, on the right side. The advantage of being both a printer and an amateur scientist in the 1850s is that you could publish your own scientific discoveries. In 1853, Jacob Stauffer published and printed a curious little pamphlet about his plant discoveries in Mount Joy, Lancaster County. He moved there from the nearby village of Manheim, and brought with him the first printing press both towns had ever seen. Jacob crafted this pamphlet entirely by hand: He wrote the manuscript, drew the illustrations, printed the lithographs, printed the text, and stitched the pages. Jacob used this pamhlet to announce to the world the discoveries he had made during his botanical rambles in the Mount Joy area. Jacob was the first to discover that several local wildflowers (Comandra and Gerardia, Here and Here) had parasitic root systems. The pamphlet is titled "On the Parasitism of Comandra and Gerardia." Jacob was encouraged to publish these findings by Dr. Asa Gray of Harvard, the most important American botanist of that century. Jacob could not say No to Dr. Gray ...hence this exceptional little pamphlet. 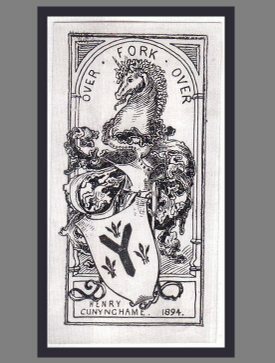 Above: Conestoga Wagon Detail from a c. 1890s Bookplate by David McNeely Stauffer. The story of printing in Lancaster County includes Jacob Stauffer's son David McNeely Stauffer, even though David was not a letterpress printer. David was born in Mount Joy, in 1845. He graduated from Franklin and Marshall College and established a successful career as a civil engineer. David is a premier historian of American printmaking: engraving on copper and steel. He authored the pioneering study of American prints that is unsurpassed even today, his 1907 American Engravers Upon Copper and Steel. David donated his monumental collection of 14,000 American engravings to the New York Public Library, where it is known as The David McNeely Stauffer Collection of Early American Engravings. 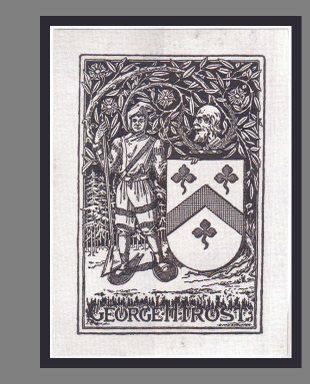 David is also renowned as a masterful designer and engraver of bookplates. 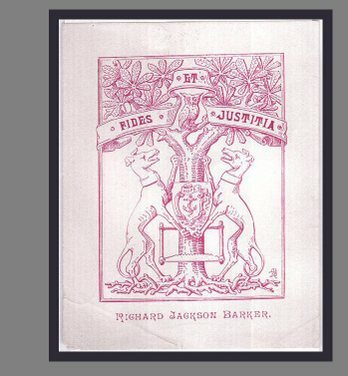 Beginning in the 1870s, he created numerous bookplates for friends and relatives. David McNeely Stauffer's papers are housed at F&M College, Here. 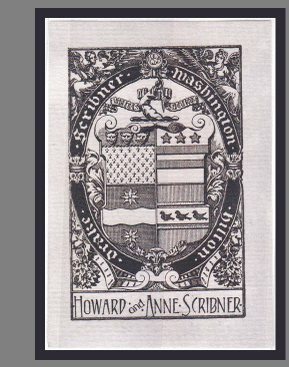 The college also has a Stauffer bookplate collection, Here. The Smithsonian Archives of American Art has his papers, Here. Florence married David McNeely Stauffer in 1892. 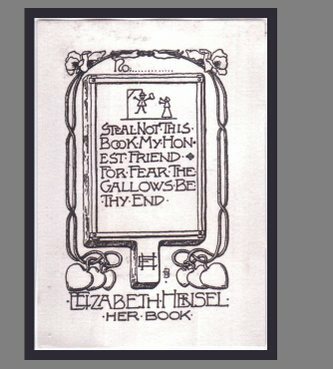 Two years later David engraved this bookplate for her. Florence was born in Inglehurst, New York. Her father was Hon. G. Scribner Hilton, the secretary of state for New York state. Her mother was Sarah Woodbury Pettingill. Elizabeth was a Daughter of the American Revolution. Her family history is Here. Florence and David met in 1891, on a cruise from New York to Panama, when they were shipwrecked for a week on El Roncador Island. Florence and David named their New York house "El Roncador", in memory of their shipwreck adventure. I am not sure how all these Scribners are related to the New York Scribner publishing families. My guess is that they were all somehow related. George Henry Frost was David's civil engineering business partner in New York City. David moved there in 1882. Their company specialized in municipal water works. George founded the magazine Engineering News, and George bought in as a partner in 1883. This magazine continues strong today as ENR.com ...Here. ...with information about George and David on the "About Us" page. William Uhler Hensel, born in Quarryvile, Lancaster County, was attorney-general of Pennsylvania, beginning in 1891. He was president of the board of trustees of Lancaster's Franklin and Marshall College from 1915 to 1916. He helped found the Lancaster Historical Society, and was president of the Pennsylvania German Society. For 12 years he co-owned of the Lancaster Intelligencer, with Andrew Jackson Steinman, until Uhler sold his interest in this newspaper in 1886. Franklin and Marshall College's Hensel Hall is named for this Hensel. Elizabeth Hensel was the only child of Hon. 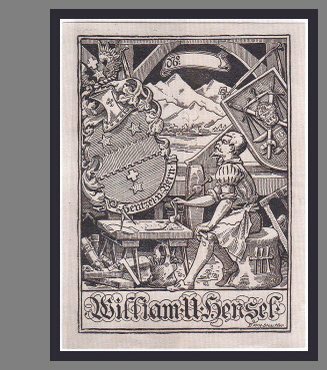 William U. Hensel (see his bookplate above) and Emily Flinn Hensel. Elizabeth was actively involved with the Lancaster County Historical Society. 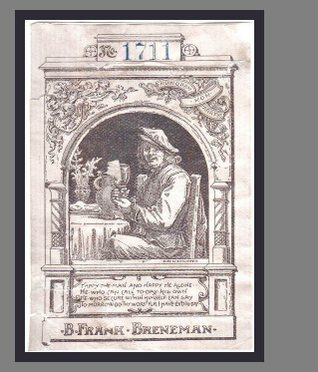 Benjamin enjoyed his pleasures, including two years' travel in Europe ...which probably explains why he is dressed like Rembrandt, holding a roemer drinking glass. Benjamin helped create Lancaster's Hamilton Club, and was its first president for 12 years. Redmond Conyngham was a somewhat elusive Lancaster attorney. He is overshadowed by he prominent namesake, the Lancaster historian Redmond Conyngham (born 1781 - died 1846.) I am currently trying to figure out how these two Redmonds were related. The name is also spelled "Cunningham." I am still trying to figure out exactly who these Cunynghams are. 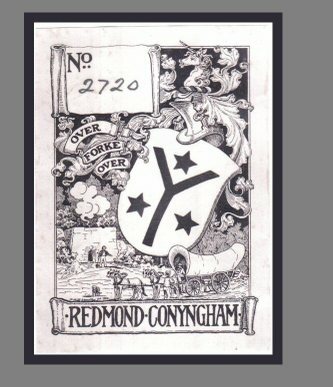 Henry is obviously related to Redmond Conyngham (above), who is obviously related to the Lancaster historian Redmond Conyngham. One of these days I will figure out who's who. The Barker family had a successful lumber business in Fall River, Rhode Island. It looks like these great danes are preparing to saw down this chestnut tree in memory of Richard Barker. Richard's impressive Colonial Revival home in Tiverton, Rhode Island, is Here. 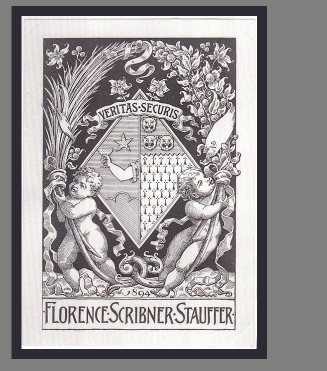 Credit: While most of the images on this website are of items in Clarke Hess' collection, I received these Stauffer bookplate images are from the confessed bookplate junkie Lewis Jaffe of Philadelphia.